Distinguishing Characteristics Caucasian female. Brown hair, blue eyes. Alsup has a scar near her right eye, a scar on her left arm, a mole on her left shoulder, a tattoo on her neck and a tattoo of a butterfly on her left shoulder. 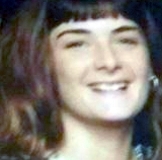 Alsup was last seen in Indianapolis, Indiana on February 11, 2006. She has never been heard from again. Few details are available in her case. Updated 2 times since October 12, 2004. Last updated January 21, 2017; four pictures and date of birth added, distinguishing characteristics updated.